ROCKHAMPTON is swimming ahead of the school, with the introduction of net free zones from Keppel Islands through to the Fitzroy River. 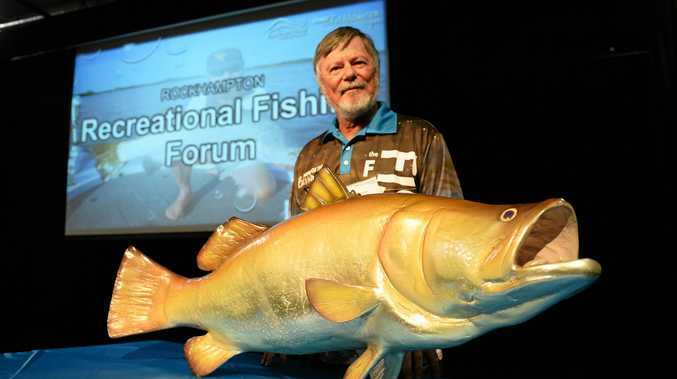 Luring in people from across the state to attend the Rockhampton Recreational Fishing Forum, the example set by Rockhampton in its initiative to introduce Net Free Zones has, according to industry professionals, made other councils "sit up and take notice". Bill Sawynok, manager for InfoFish Australia in Rockhampton, said the introduction of net free zones had allowed fish stocks in the region to re-populate and grow. "The interesting thing is that Rockhampton has been the leader in this whole thing. "In terms of being the first ones to introduce the strategy. "We've had a very good monitoring system here for 30- odd years, so we have an absolute understanding of fish stocks," Mr Sawynok said. He said the flow-on effect of the net free zones had been extraordinary. "They are brand new businesses that weren't in existence before the net free zones. "The fish stocks in the river, in particular, are very healthy so catch rates are much better than they have been for over 20 years," he said. For local fisher and owner of Guided Fishing Down Under, John Haenke, the net free zones are the reason he relocated his business to Rocky. "It has a huge impact, in fact it is the reason we are here. "The commercial netting where we were has pretty well wiped out the fishery down there," he said. "It needs to be sustainable, and what was happening where we came from wasn't." In terms of business growth, Mr Haenke says the net free zones have helped increase bookings and encouraged more tourism into the region. "I know from speaking to other businesses in town, certainly as far as accommodation, restaurants and tackle shops, they are all noticing a big increase in recreational anglers that are coming to Rocky - and the Net Free Zones is what has done it." Mayor Margaret Strelow reflected on the region's increasing success. "It was just over 13 months ago we held a forum here talking about the benefits of the net free zones and what a difference that time has made," Cr Strelow said. "I have to pay tribute to former Rockhampton MP Bill Byrne who had the guts to fight for the NFZs in the first place and to Advance Rockhampton who have aggressively pursued, promoted and pushed every opportunity to grow our fishing tourism industry."